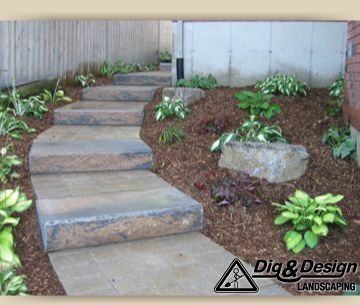 Dig & Design Landscaping provides complete landscaping services to residential and commercial clients in Peterborough, Kawartha, and the surrounding areas. Locally owned and operated, we offer highly trained workmanship backed by many years of experience in landscape design and construction, including skilled carpentry, extensive knowledge of plant species, water features, and hardscapes such as retaining walls and walkways. Fully licensed and insured, we are committed to helping our clients’ dreams become a reality. Attention to detail, professionalism and tidiness are just a few of the characteristics that separate us from the typical landscape contractors. During our free, on-site consultation, we work closely with you to devise a design based on your style and budget, and we maintain communication with you throughout the construction and installation process. We set the highest standards for quality and safety. Dig & Design is so confident in our ability to deliver excellence, we back our landscape and hardscape projects with a 5-year warranty! Contact Dig & Design to discuss your landscaping ideas and a free estimate. We proudly serve Peterborough and the surrounding areas.